But to get here to this sunny afternoon at a park near his home, Joshua had to travel more than 5,000 miles and undergo a complicated medical procedure most surgeons have never attempted. Joshua was born with congenital scoliosis, which causes abnormal rotation and side-to-side curvature of the spine. He also has diminished lung capacity caused by restrictive lung disease and thoracic insufficiency syndrome—conditions both related to scoliosis. Joshua spent his first five years in an orphanage in Ukraine. Later, he was moved to a school for children who have disabilities. On Nov. 30, 2013, however, Julie and Bob Reis changed his life—and their own—forever. They adopted Joshua and brought him home to their family in Minnesota. 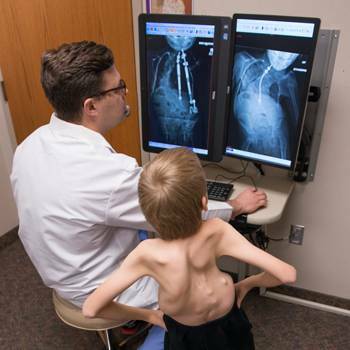 Three days after the family returned to Minnesota, they took Joshua to see Tenner Guillaume, MD, an orthopedic surgeon at Gillette Children’s Specialty Healthcare who specializes in spine surgery. 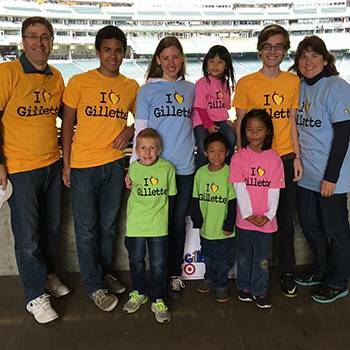 Guillaume worked with Joshua and his family to form a customized treatment plan for Joshua. During the next 33 days, the family met with Gillette specialists from pulmonology, cardiology, neurosurgery, radiology and imaging—all intent on working together to give Joshua the best life possible. Joshua’s treatment plan included several surgeries, including a pioneering procedure to implant magnetically driven growing rods. The implanted rods act as internal braces to keep the spine from curving. They also expand to allow for normal skeletal growth. Joseph Perra, MD, another Gillette spine surgeon, joined Guillaume in the operating room. Working together, they placed two magnetically driven growing rods, freed some of Joshua’s fused ribs, and restructured his right shoulder. Guillaume lengthens the rods during outpatient visits using a remote controller in a procedure that lasts just a few minutes. Over time, these lengthening procedures will help Joshua grow taller. Joshua’s medical team will track the progression of his curve throughout his childhood using X-rays. Editor's note: Watch a video about Joshua to hear more about his journey. Photos (from top): Joshua enjoys riding his bike; Joshua with his surgeon, Tenner Guillaume, MD; Joshua with his parents and siblings.